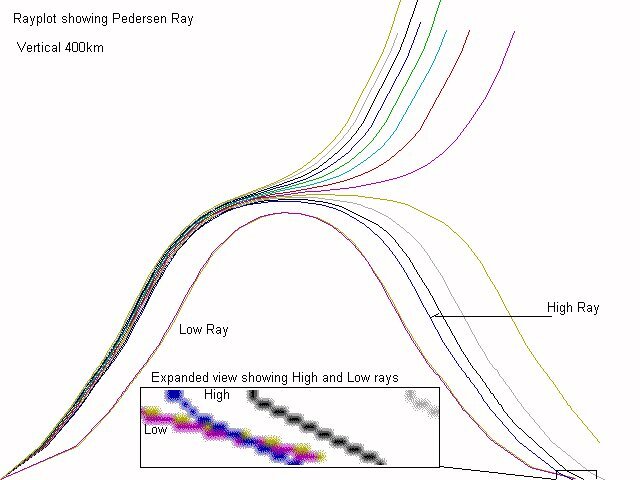 What is a Pedersen Ray? The diagram above may help in explaining this effect. Paths 1, 2 and 3 are fairly conventional ionospheric refractions launched from the transmitter at increasing angles. Conventional wisdom is that the lowest angle path goes furthest. So amateurs aim to get low angle radiation. Good idea? Maybe. Paths 4 and 5 are Pedersen rays or high-angle rays. These rays are not refracted sufficiently to return directly to the earth but don't have a high enough angle to penetrate (like ray 6). They get trapped in the ionosphere often exiting where there is a big gradient in electron density (at dusk and dawn). The plots below are the result of both high and low angle rays being present at the same time. An effect that we are normally unaware of! Given this model, we might reasonably expect to see four components on an oblique path as it fades out: o and x wave from the low angle path and o and x waves from the high angle path. Each with different Doppler shifts. Interestingly, this will come as no surprise to top-band DXers who will have noticed that sometimes at dawn and dusk a high-angle antenna such as a dipole will work better than a vertical - but only for a short while! This has yet to be explained fully but may be due to Pedersen Rays. On reflection, I think that the Pedersen Ray is subtly different from Chordal hop propagation in which low angle rays hop out of the ionosphere and back in again, thus travelling long distances without lossy ground reflections. Chordal hop propagation is almost certainly responsible for low dispertion round-the-World echoes. Peter Martinez has produced the diagram above which is worth considering. It was produced using a ray-tracing ionospheric model and shows the launch of rays at different angles from a transmitter (left) to a receiver (right). The model produces rays using spherical co-ordinates which accounts for the odd curvature near the surface of the earth (since here Peter has shown a flat earth). This curvature does not happen in a 3D world. The interesting point to note is that the low rays arrive focussed while the high rays are very sensitive to the launch angle and arrive unfocussed. This means that the high ray signals will be rather weak compared to the low ray signals. My suspicion is however that at dusk (and probably dawn), the high rays may also focus for a short time. This would account for why they become visible on the Doppler traces and also why the "topband" high angle enhancement effect takes place. Expert comment would be welcome! Attached is an interesting Dopplergram, taken this evening on 7275kHz. The signal is Radio Exterior de España. It starts off as straight F-layer with some Doppler wobbles, but about 1940z two traces start from about 1Hz low and join the main trace just as it fades out. These are the O (top) and X (bottom) Pedersen, or high angle rays, which are only visible on oblique paths. After the fade-out there is a stable single trace about 30dB below the F-layer signal level. I don't have a clue what propagation mode it is, but I don't think it's backscatter, since the AM modulation has no detectable multipath. The plot above is something similar seen here at G3CWI. The plot starts with the o and x waves making clearly separate paths through the ionosphere. 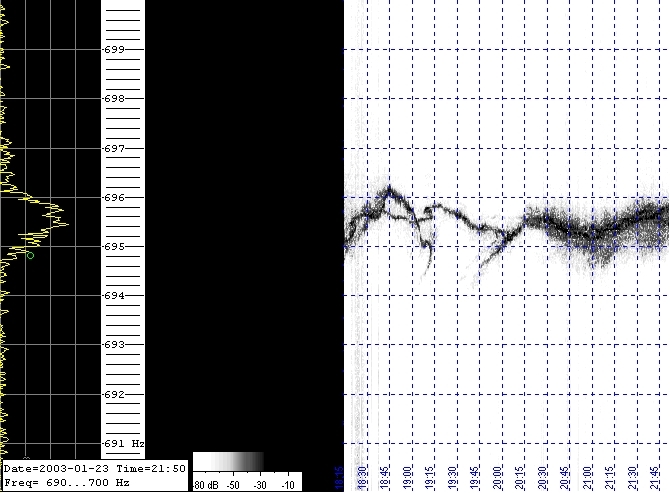 Just after 1900 one component shows a switchback (695.8Hz) while an odd return from LF doubles back on itself. At 1945 two other component come up from LF to join the main trace. 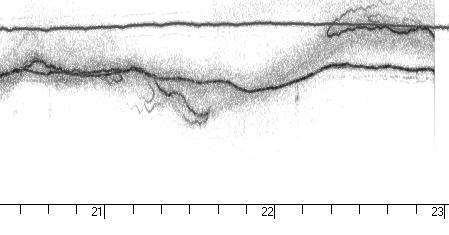 The trace then becomes much more diffuse as the F layer gives up leaving backscatter. This plot was done at 7275kHz. This plot was done by Peter at the same time as mine and on the same signal. Peter's trace shows the same event as mine but there are some differences. Note how Peter records much finer detail - I suspect this is, in part, due to his quieter location. Especially interesting is the horizontal trace visible from 1930 to 2015. Peter has often seen this effect which is not easy to explain. It is not visible in my own plot. This plot done by me a month later shows the same form which seems an odd coincidence. I am now using Peter's software and it clearly gives better results than SpectrumLab. This remarkable plot from Peter shows "Pedersen loops". The transmitter is at the edge of the skipzone and the loops occur when the skipzone is moving a little so that sometimes that transmitter is in the zone and sometimes it is outside it. I don't understand the mechanism that makes the loops however. This plot by Peter combines the best of all Worlds. We have been observing Radio Nacionale de Espana for a while as it shows such interesting effects. In particular we have often observed three Doppler components. This plot begins with all three. One breaks into two at 1910, another at 1925 and the final one at 2100. We speculate that the two components are the o and x waves. If correct this is interesting as it implies that many plots with two distinct traces may be being misinterpreted (by the professionals...). What is implied here is the the conditions for propagation are met in three distinct ways. Perhaps one might call them E, F1 and F2 though this simplistic model is probably inadequate. This plot also suggests that the o and x waves are only doing distinctly different things as the layers recombine. The odd backwards curvature is believed by Peter to be due to high angle paths though I find the leap from understanding high angle paths to predicting this Doppler effect difficult to explain. Peter's plot also shows some nice loops after the main fireworks are over. The second loop being rather more obvious than the first. As ever, if anyone can offer better explanations of these effects, please contact me via email. This plot - also of Radio Nacional done by me on 28 Feb 2003 shows another interesting effect. The vertical scale is 2.5Hz and the horizontal line at the top is a locally generated stable signal. Of interest is the signal that starts HF at 2220. The abrupt end occurs when Radio Nacionale cuts carrier at 2256. I have asked a number of professional workers in the field if they can help in explaining these effects.